"I don't think I can be a very good son right now." 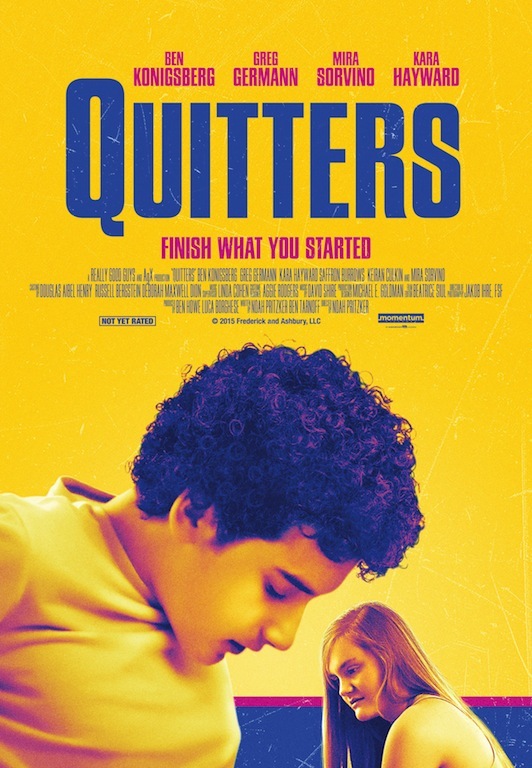 In “Quitters,” young Clark (Ben Konigsberg) is a smart-aleck San Francisco teen who thinks he can outsmart the entire world, but his home life is a mess. His mother (Mira Sorvino) has a prescription pill addiction that lands her in rehab, and Clark doesn’t have much of a relationship with his impatient father (Gregg Germann). So what does he do? He decides to find a new family, specifically the family of an attractive classmate Natalia (Morgan Turner) who lets Clark temporarily move in as a houseguest. When conflict inevitably arises, it’s up to Clark to face up to the reality of his situation. The film also stars Kara Hayward (“Moonrise Kingdom”), Kieran Culkin (“Margaret”), Saffron Burrows (“Mozart in the Jungle”), and Scott Lawrence (“JAG”). Watch an exclusive trailer for “Quitters” above. “Quitters” opens in select theaters and VOD on July 22. Check out a poster from the film below.